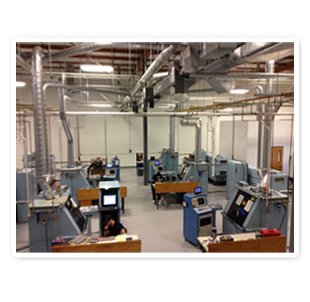 CO2 lasers have been the industry standard for machining, drilling, and scribing ceramic substrates for over 40 years. PM Industries is a pioneer in this field with over 35 years in the Co2 lasering business. 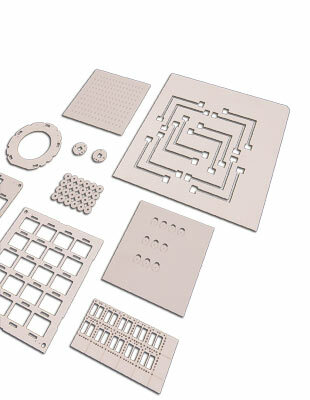 With a wide assortment of customized machinery, PMI has developed a reputation as the industry leader in processing high thermally conductive materials such as Beryllium oxide (BeO) and Aluminum Nitride (AlN). In addition we also manufacture products on Alumina (Al2O3), plastic, Stainless steel and a variety of other materials. All of our machines have optical cameras for precision alignment to metalized parts. A key advantage PMI has over our competitors is our in-house lapping capability. We are in a unique position to offer our customers a finished product that has clean via holes, reduced wall taper, and virtually no heat affected zone by way of lapping after laser processing. Our engineers and technicians are constantly looking for ways to improve quality and throughput by designing custom fixturing and CNC programs that enable us to produce complex parts at very competitive prices. We also have the ability to import CAD drawings directly into our CNC programming software which improves lead time, reduces NRE cost and ensures the product is built to your specifications. We offer a variety of post lasering processes such as clean firing, annealing, tumbling and singulation services. *Please contact our sales or engineering group for detailed inquiries about our services.